που θα υλοποιηθεί την Τρίτη 23 Σεπτεμβρίου 2014 και ώρα 18.30, στο Μακεδονικό Μουσείο Σύγχρονης Τέχνης, εντός του χώρου της Διεθνούς Έκθεσης Θεσσαλονίκης. Phemonoe is sponsoring the 2nd Roundtable, of Triple Helix event in Thessalonki, Central Macedonia, Fubruary 24 / 2014, with the subject:Smart Specialization: New Generation Entrepreneurs in the Triple Helix Ecosystem.The THA Chapter of Greece kindly invites you to participate in the 2nd Roundtable Discussion on Triple Helix Interactions and Smart Specialization on Monday, 24th of February 2014, Thessaloniki, Greece! Phemonoe and the THA Chapter of Greece kindly invite you to participate in the 2nd Roundtable Discussion on Triple Helix Interactions and Smart Specialization on Monday, 24th of February 2014, Thessaloniki, Greece! Welcome to a Breakfast Seminar about the ICFS course on the 4th of March in Helsinki. This free of charge seminar will give you the opportunity to meet all ICFS consortium partners and get an insight into the ICFS course and its content. Moreover, you will be able to listen to one of the participants of the ICFS pilot course, who will tell about his own experience in joining the course! 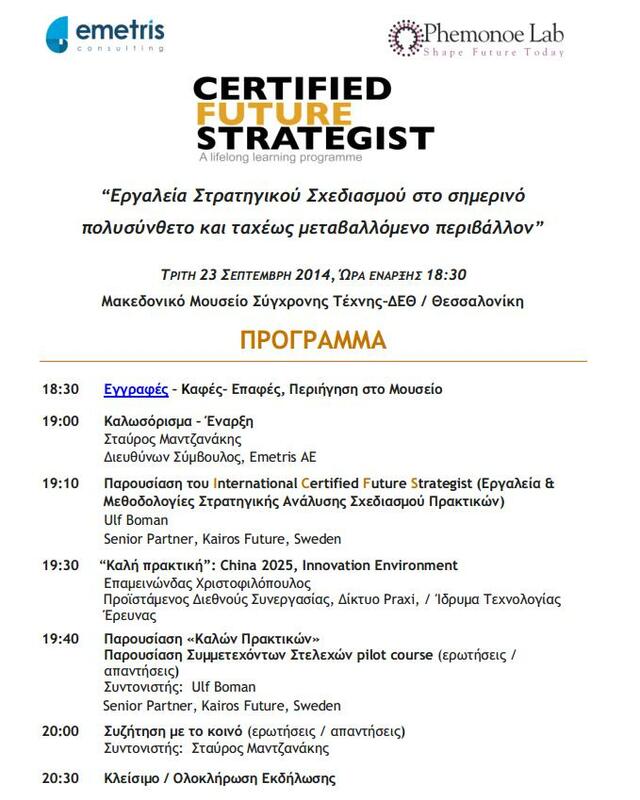 Sign up for the seminar by 24.2.2014 by contacting Consultant Nette Lehtinen +358 504336244 or nette.lehtinen@capful.fi. For more information about the breakfast seminar and the ICFS course please download our brochure . The 5th INCO conference is scheduled to take place on June 2-3, 2014 in Athens, Greece. The venue of conference is the Divani Palace Acropolis which is located below the Acropolis, very close to the old quarter of Plaka, the brand new archaeological Museum of Acropolis and the well known Herodion theatre. The main objective of the conference is to highlight the need for global cooperation for addressing common challenges to secure a better future. The conference will also host the annual meeting of the national INCO experts as well as a special training session on international research collaboration. This year’s regional focus will be the European Neighborhood while most of the conference sessions will have a global focus. Discussions will address critical issues such as the future of research in relation to the global challenges lying ahead in order to acquire insight for future coordinated actions. To this end, invited speakers from worldwide organizations funding research will share their experiences, best practices and obstacles. The Phemonoe Lab will participate in the Conference presenting the on-going work for the Research Trends in China.